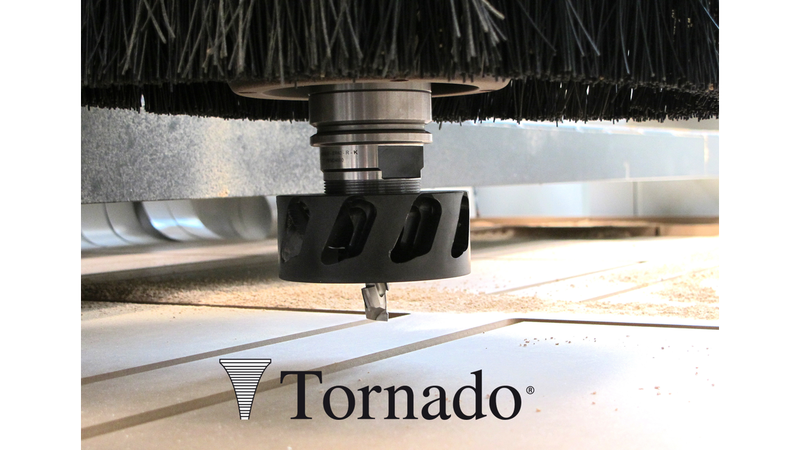 The first model of Tornado® was introduced in the market in March 2014 experiencing a great success among worker and machinery operators due to its great results. Since that time, many other producers have tried to copy our Tornado® making only "poor copies". Now, Sistemi has developed and introduced in the market, a NEW VERSION of TORNADO®, even more efficient, reliable and higher performance. The new solution by Sistemi helps both dust and chipwoods evacuation during Nesting and conventional CNC Routing operations. Easy to assemble directly on the collet chuck instead of the standard nut, the new Klein Tornado® provides a big improvement of dust evacuation, removing it from the work piece directly into the centralized extraction system of the CNC machine.